Look through the personal belongings of the deceased. A will could be located in a safe or filing cabinet. Look for any other end-of-life planning documents such as life insurance policies, retirement accounts or paperwork concerning any financial account with a named beneficiary as wills are commonly stored alongside these documents. 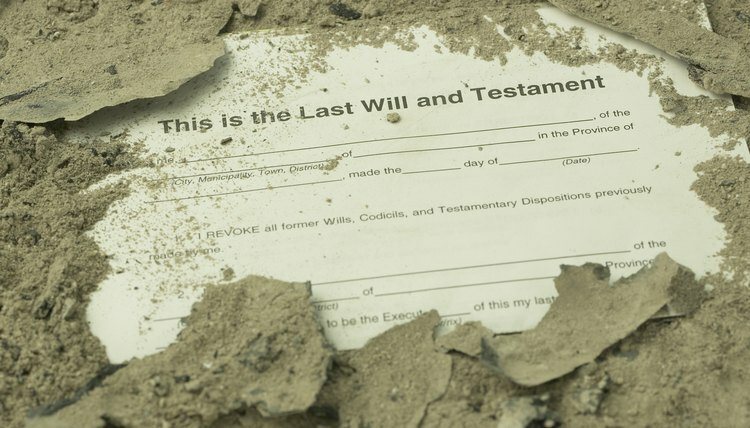 Ask close friends and family members of the deceased if any have copies of the will. Individuals will often leave a copy with their chosen personal representative, who is the person responsible for managing the estate during probate. The personal representative is often a close friend or family member, so these people may have information about the location of the will. Check any safety deposit boxes owned by the deceased. The banks that maintained the individual’s finances will be able to help you access a box if one exists. Be prepared to show proof that you have authorization to access the box, which may include a court order, death certificate, written permission or a number of other requirements set by the institution. Ask any attorney you know may have worked with the individual to prepare her will. Many attorneys will keep copies of their clients’ wills. If you don’t know of any specific lawyer, contact your state’s bar association to ask about publishing a notice in the state’s bar journal. Many attorneys in the state read the bar journals, and notes about missing wills are common. Free Advice: How Can I Find Out If There Was a Will?